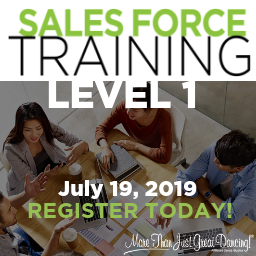 More Than Just Great Dancing® Sales Force Training Level 1. Ready to transform your team into a powerful steam engine for sales and growth? Come to MTJGD’s Sales Force Training Level 1 and give your business a radical sales facelift! Get on board! Please contact our Event Director, Krisa Roggensack, [email protected] We look forward to seeing you in Onalaska!